Explore the best of Kansas city wine on this 5 hour wine tour. Ride in a comfortable mini bus with a knowledgeable, expert driver and guide as you sample three wines at three or more stops both within the urban core and at nearby vineyards. Get exclusive insight into the inner workings of an urban winery and discover Kansas City's burgeoning wine scene. Ever wondered what an urban winery looks like and how it operates? Curious about why early brewers first decided to cultivate hops as a superior alternative for brewing beer than other flowering plants? Want to know why whiskey producers use copper stills to distil flavorful spirits from sour mash? Kansas city has seen an explosion of interest in craft beers, fine wines, and small production spirits in recent years, and larger numbers of people than ever before have started asking themselves these questions. 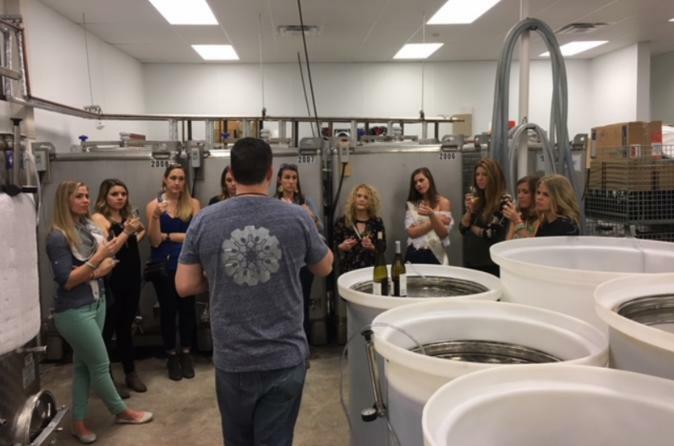 This tour offers you the opportunity to answer some of these questions and more during a five-hour adventure trekking across Kansas City's urban core and outlying areas discovering what's happening in the urban wine scene. This exclusive KC winery tour starts at the Ollie's Local, from there you will head to the minibus for a short drive to you first official winery location. The tour operator maintains partnerships with an ever-expanding portfolio of wineries and producers located within and around Kansas City and rotates among three select establishments to ensure variety and diversity throughout the trip. At each stop, you will taste a minimum of three different wines - both red and white - with additional pourings available at select locations. If you find something you want to take home, go ahead and purchase it! Each vehicle comes with a shared cooler holding water and small snacks and space to store wine throughout the day. After visiting three select wineries and hearing the stories of these small business and the process by which they make wine, you will be dropped off back in central KC at your vehicle to make your way home from there. Don't forget to make arrangements for a ride home - this tour promotes learning and moderation while maintaining a safe environment throughout the day.